Almost everyone in today’s business world has experienced the frustration of meetings on scheduling more meetings, the one-hour meeting that stretches well into the afternoon, and most agonizingly, the crush of work that follows the valuable time spent planning for, scheduling, and organizing meetings. What's more, all these matters affect also the meeting cost. Learn more about it from our newest eBook. How much time do office workers spend in meetings? 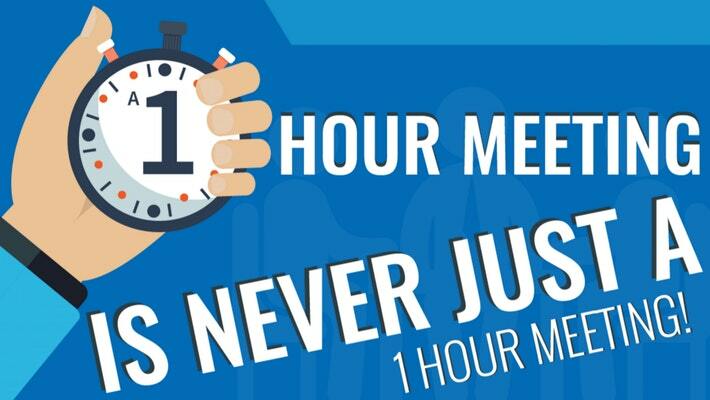 Every day in the U.S., there’s an average of 11 million meetings taking place. The average office employee spends over five hours each week sitting in meetings and over four hours preparing for them. That’s more than an entire working day devoted to meetings. Managers fare even worse, logging an average of 12 to 14 hours a week in meetings. Sources tell us it’s only getting worse, with meeting frequency increasing year over year. Add it all up to 62 hours a month that the average office worker spends sitting in meetings, 37% of which are valued as unproductive. That’s millions of hours wasted, productivity lost, and resources squandered. It isn’t just meeting attendees who suffer. Unnecessary meetings cost U.S. businesses approximately $3.7 billion a year. It’s no wonder that when asked, leagues of frustrated employees rank meetings No. 1 on the list of time wasters. When so much of today’s office culture is centered around the meeting room, how does one make time for actual work? Our free eBook has the answer. A meeting is never just a meeting. Indubitably, more work goes into preparation than meetings themselves. A huge part of that is the process of finding a meeting place. Today, employees report spending up to 30 minutes a day, every day, looking for unoccupied rooms within the office to meet. Rooms are commonly booked, only to be left vacant. In fact, a recent study by Performance Building Ltd found that the average company’s meeting rooms are booked 92% of the time, but 15% of those reservations are not used. Limited spaces are wasted, energy is consumed, and valuable meeting time and cost are spent looking for alternatives. Meeting management software takes the frustration out of the meeting booking and handling process, takes care of guests, and delivers analytics to improve overall meeting room utilization. You don’t need a fancy infographic to tell you the value in that. See it in action.